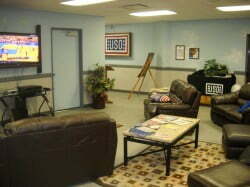 So we are at Kadena AB in Okinawa and we had just taken a taxi to the USO at Gate 2. We were on our way to a Philippines store that had the balikbayan boxes and we wanted to walk the rest of the way to check out where we use to shop a lot. So we walk past the gate and over the expressway just looking. It is very hot and humid out here walking. We were disappointed. We were disappointed because almost all the stores are closed down now. I don’t mean just for the day either, I mean for good. It looked like to us that more than half of the stores were closed down. There were only a few people on the streets where before there use to be hundreds of them. More on that in a bit. We walked about 4 blocks and I spotted the Philippines store about 3 stores up on the right side of that side road. I was wondering if it was even open, but it was. Just as soon as you walk in though, you know for a fact that there is no air con on. I was sweating more in the store than I was outside. We talked with the Filipina that owned the store and found out that mailing a box from there to Samar would be $207. That’s including a pick up charge of around $7. I starting thinking that if we did this, we might be putting ourselves in unnecessary trouble. We still don’t know if we can get on any flight at this time and if we do find out, we would not be able to do anything about shipping this box because we would have to get ready our immigration taken care of and get right back to the terminal or we would miss the flight. So if we did this, we would HAVE to stay until the end of the month. It was getting complicated, because I didn’t think it would cost as much going from Japan to the Philippines as it did going from Texas to the Philippines. Lita wanted to do it, but I had really changed my mind now and I finally talked her into not doing it also while we were walking back. While we were walking back, we stopped in a store and talked with the owner for awhile. He wasn’t doing anything else anyway. He said that things have really been drying up around there and he wasn’t sure how much longer he could stay. I didn’t walk over to the next street where most of the clubs were before (I couldn’t since I had Lita with me), but maybe they had a little bit more action going on over there. After we left the guy’s tailor shop, I think I figured out the major reason why things are drying up there. On base they built a new Base Exchange (BX) and it is huge. Check out this picture below. It is only part of the upstairs of the BX. They have improved the shopping for the military on base so much that is has become impractical for them to shop off base. The prices on base are less and there is no tax. There are probably some things that you can get off base that are not in the new BX, but those things will be few and far between for most people. There is also plenty of concessions on the ground floor, including an extensive food court. 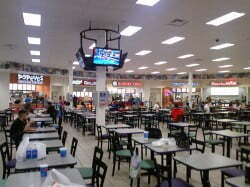 Here is a link to a picture of the Kadena AB food court. It’s at a Japanese Baseball Experience website that looks pretty interesting. You can click this link to see a story about the opening of the new BX and just how large it is. They even have escalators going to the second floor now. So as you probably figured, after 4 nights at Kadena, we decided that it’s not what it use to be and it’s too hard to get around here without your own mode of transportation. The taxi’s cost way too much and there is no shuttle bus service to the best of my knowledge. At least I figured someone would have let me know if there was one by now. We wanted to explore a little further off base, but, as I said, without your own vehicle, it would cost way too much. Besides, I just found out that a flight going to Manila was coming in today. The flight was one that we really was hoping to get on and when we got to the terminal, early, there were not too many people there, so there was hope. There was hope until about 45 minutes before the roll call, people started pouring in. I’m talking people with 4, 5 and even 6 children. I know what you’re thinking, you’re thinking how could there be so many people wanting to go to the Philippines. The answer is, they don’t. The flight makes a stop in Guam before it goes to Manila. Now Joe and Margarita are trying to get to Guam, but with all the families and the people with higher priority, there is no way they make the flight. We went back to billeting and they went back to their son’s house. That was the first time, the only time (so far) that we had a chance to get on a flight and it didn’t make it to our name. I suppose that if we continue to fly Space A though, it will happen again and probably many times. Later there was a small jet going to Manila. It’s one of the ones that only takes 6 passengers and there is a weight limit of 30 lbs of luggage per person. We signed up and waited. While we waited, we were digging through our luggage trying to figure out how to get from 93 lbs down to 60 lbs of luggage. 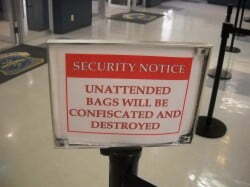 We were ready to leave and even prepared to leave some of the contents of our luggage there if necessary. It turns out, three times, that it was not necessary to leave anything. First Margarita said that she would take the stuff for us and put in in her extra suitcase. She would bring it to Guam with her and when we sent her the money, she would send it all to us via balikbayan. We were ready to do that. When they did the roll call for the flight, the full 6 seats were available, but only 4 of us were signed up for the flight. Us and 2 older gentlemen, also flying Category VI. I started thinking, again, and the second time came up. I talked to the passenger terminal NCOIC (Non-Commissioned Officer In Charge) and asked him if we could have the extra 33 lbs of luggage since there were still actually 2 empty seats? The 33 lbs is far less than having 2 more passengers plus their 60 lbs of luggage. The went ahead and processed all our luggage through. So were in the waiting area waiting to board a flight that is not even on the ground yet, when someone comes in and said that they made a mistake. The incoming flight is NOT going to Manila today, but tomorrow. I’m thinking to myself, “You have got to be kidding”. He was not, but …..
I’ll tell you next post. Interesting Knowledge: In 1946, Marion Donovan was surprised when her prototype for disposable paper diapers was met with ridicule. She journeyed to all the major U.S. paper companies, and was laughed at for proposing such an “unnecessary and impractical” item to replace cotton diapers. After nearly 10 years of pitching her revolutionary idea, Victor Mills had the foresight to capitalize on it, and he became the creator of Pampers. Pope Benedict XVI concludes World Youth Day with a mass. Over 800,000 people attended the closing liturgy. A grenade attack on Bangladesh Awamee League, the bigest political party in Bangladesh kills 22 and injures more than a thousand, including party president Sheikh Hasina. Jean Chrétien, Prime Minister of Canada, announces that he will not seek re-election and would resign within eighteen months. The Red Cross announces that a famine is striking Tajikistan, and calls for international financial aid for Tajikistan and Uzbekistan. The United States destroys a pharmaceutical plant (erroneously believed to be a chemical weapons plant) in Sudan. The British Rock Group Oasis release album, Be Here Now. NASA loses contact with the Mars Observer spacecraft. Hard rock band Guns ‘N Roses release their classic debut Appetite for Destruction. Toxic gas erupts from volcanic Lake Nyos in Cameroon, killing over 1700 people. Black Panther George Jackson is shot and killed in the prison yard at California’s San Quentin prison. Soviet Union-dominated Warsaw Pact troops invade Czechoslovakia. Dumbarton Oaks Conference, prelude to the United Nations, begins. The Mona Lisa was stolen by a Louvre employee. The first successful adding machine in the United States was patented by William Seward Burroughs. The Virgin Mary, along with St. Joseph and St. John the Evangelist reportedly appear to the people of Knock, County Mayo, Ireland. Lawrence, Kansas is destroyed by Confederate guerillas Quantrill’s Raiders in the Lawrence Massacre. The venetian blind is first patented in the United States by John Hampson. King Gustav III completes his coup d’etat by adopting a new Constitution, ending half a century of parliamentary rule in Sweden and installing him as an enlightened despot.